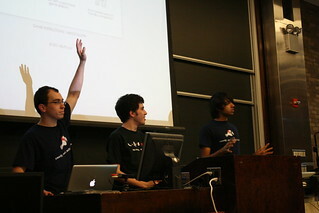 The Spring 2011 Hackathon brought in hundreds of students from nearly 50 universities in the U.S. and Canada to NYU's Courant Institute for 24 hours of creative hacking on New York City startups' APIs. Selected startups presented their technologies at the beginning of the event, and students formed groups to brainstorm and begin coding on their ideas. Many students worked into the night, foregoing sleep to fulfill their visions. On Sunday afternoon students presented their projects to an audience including a judging panel, which selected the final winners. hackNY hosts hackathons one each semester, as well as a Summer Fellows Program, which pairs quantitative and computational students with startups which can demonstrate a strong mentoring environment, a problem for a student to work on, a person to mentor them, and a place for them to work. Startups selected to host a student are expected to compensate student Fellows. Students enjoy free housing together and a pedagogical lecture series to introduce them to the ins and outs of joining and founding a startup.